Since I didn’t review Drunken Master II for the main website (check out Kozo’s take here), I can’t follow up yesterday’s Drunken Master retro review with another one focusing on its stellar sequel. 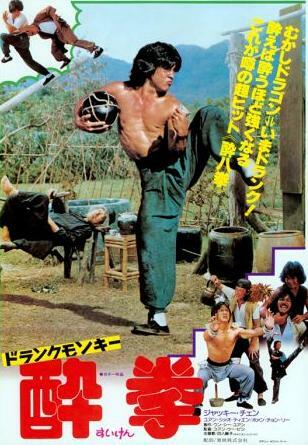 However, you can read my thoughts on Drunken Master II here, if you’re curious. To cap off this weekend of retro reviews centering on the Drunken Master series, I spotlight one of its lesser heralded follow-ups. And no, don’t worry — it’s not the embarrassingly atrocious Drunken Master III. While parts II and III both came out in 1994, there were actually contemporaneous additions to the Drunken Master series, including the Yuen Woo-Ping directed Dance of the Drunk Mantis (1979) and Story of Drunken Master (1979), which both featured Simon Yuen in the role of Beggar So (called “Sam Seed” in English dubs and the subject of the recent True Legend). However, the film that’s getting the retro review today is an unofficial prequel/sequel that focuses on the life and times of Beggar So and his longtime pal, Fan Ta-Pei — World of Drunken Master.